The summer is winding down quickly with Labor Day right around the corner. Pools are closing, leaves will be changing, and cooler weather will be upon us soon as Fall approaches! 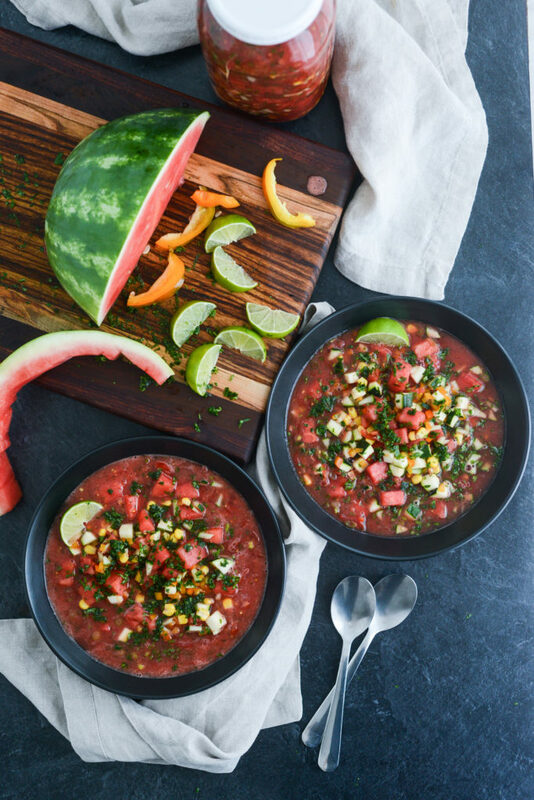 But before we see the last of summer’s watermelons, it’s time for one last hurrah with this wicked refreshing watermelon gazpacho. 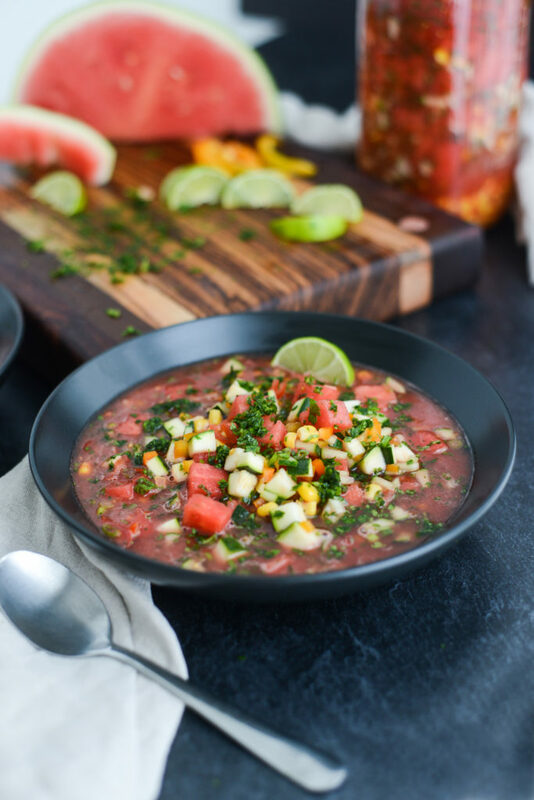 Getting back to our raw roots with this delicious, cool, refreshing soup typically made with a tomato base, we are switching it up a bit bringing in all the flavors of summer with a lime, ginger, watermelon broth, and chunks of all your favorite summer veggies. An easy soup to pull together for any Labor Day cookouts, this light and summery dish can be eaten on it’s own as a main dish or can nicely complement your favorite grilled plant-powered meals. 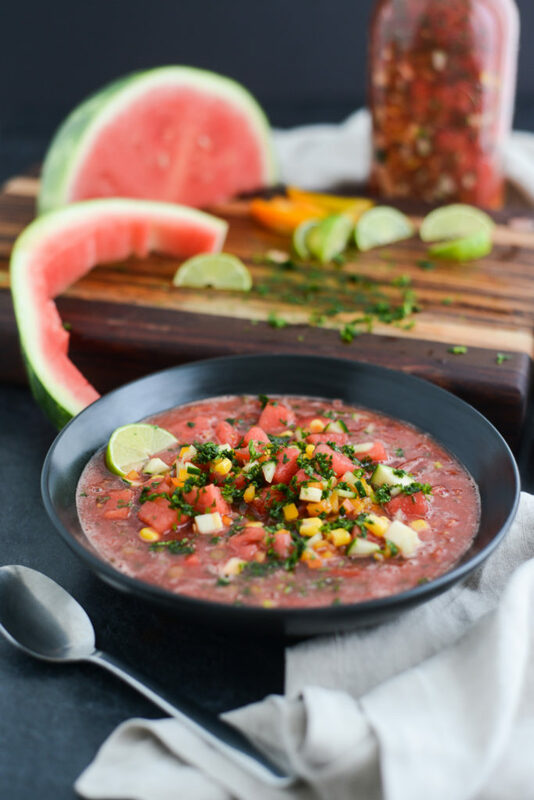 Watermelon gazpacho is as easy as chopping the veg, blending the broth, combining the two and giving it a shake to combine everything. Easy peasy. And an instant crowd-pleaser. This recipe makes about 4 large bowls of gazpacho, if you’re eating it as a stand-alone dish. If you’re serving this as a side soup with your cookout favs, you might be getting more like 6-8 bowls. We like to prepare this soup in TWO half-gallon mason jars, making a total of a gallon of soup. We got gazpacho for dayz. If you’re feeling really fancy or like you want to impress your friends and party goers, scoop all the watermelon out of each half, prepare the soup, then use the watermelon shell as a bowl to serve the soup from. Whoa. Next level. Let us know if you try it, and tag us @wickedhealthy on Instagram so we can see your watermelon gazpacho! 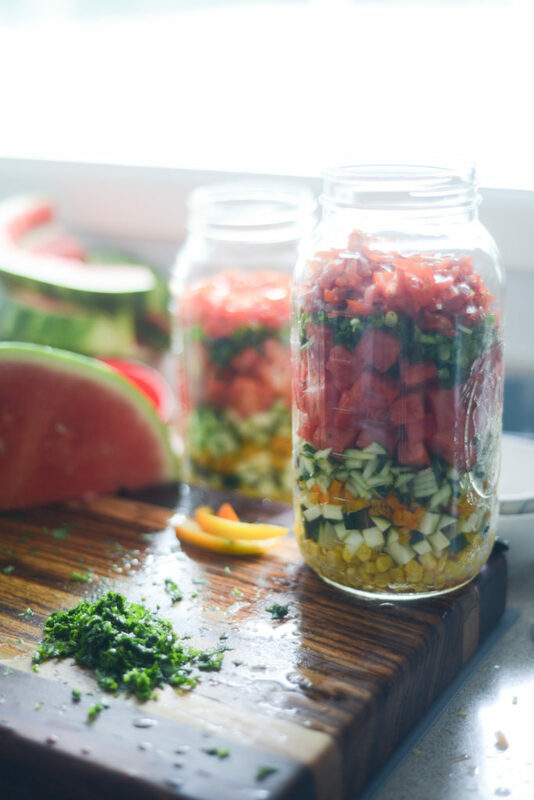 Prep all veggies and split between two, ½-gallon mason jars. Blend all gazpacho broth ingredients in a high-speed blender until everything is liquified. Pour broth over veggies in mason jars, splitting the broth between the jars, keeping everything nice and even. Put the lid on the jar nice and tight. Give it a shake to mix all the vegetables. Serve in bowls and garnish with more cilantro. Refrigerate any leftover gazpacho, and enjoy in the next few days.